All about Eve - Art Sensus Gallery a retrospective of her work. The exhibition is a superb collection of Eve Arnold's photos that celebrate the decades of her photographic career. This collection includes many photos from her personal collection. Among them are original prints from the story on migrant workers on Long Island. These pictures saw her accepted as the first woman member of Magnum Photographic Agency, in 1952. Eve's photographic career began by chance. A "beau" gave her a camera and taught her to use it. She then did a six week course with Alexey Brodovitch, a Russian born photographer and designer famous for his art direction of Harpers Bazaar. He was also famous for his harsh criticism of photographer's work. Eve's first project at this course was a fashion shoot. It was not a subject that interested her, so she decided on an alternative approach to the project. Her son's nursemaid told her about the alternative fashion shows taking place in Harlem. In the 1950's white people didn't venture there. The black models felt the white rag trade didn't cater to them. For Eve this was exactly the alternative she was looking for. She was inexperienced, naive and everything seemed to go wrong. However, Brodovitch loved the freshness of her work and told her to forget class assignments, go back to Harlem and do a comprehensive study. She spent a year photographing life in Harlem. Far to raw for American publications, none would publish her work. Her husband sent them to the British Picture Post which ran an eight page spread. 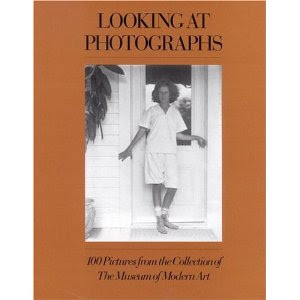 In 1951 Eve's career as a photographer was launched. Eve travelled extensively documenting and photographing subjects such as the oldest man in the world in the Caucasus. Inside the harem of sheikh Sana she made the film "behind the veil". Disturbing pictures inside a mental asylum in the Soviet Union, that outraged the communist regime. Apartheid South Africa, where she photographed black children suffering from malnutrition and disease, was one of the most gruelling assignments. Interspersed with her serious documentary work, Eve photographed celebrities and film stars. She photographed four Prime Ministers. Her photographs of Marilyn Monroe, whom she photographed extensively over a ten year period are probably her most well known work. Marilyn totally trusted Eve and allowed her to take photos that show an intimacy and spontaneity that no one else was ever to capture. While I love all of Eve Arnold's work, it is her early work in Harlem that I find the most moving and inspirational. Two of my favourite images are: Bar Girl and Milltown. What is it about these two images that I am drawn to? They are incredibly intimate. It feels like a moment that their guard has been let down showing a moment of vulnerability or lost innocence. 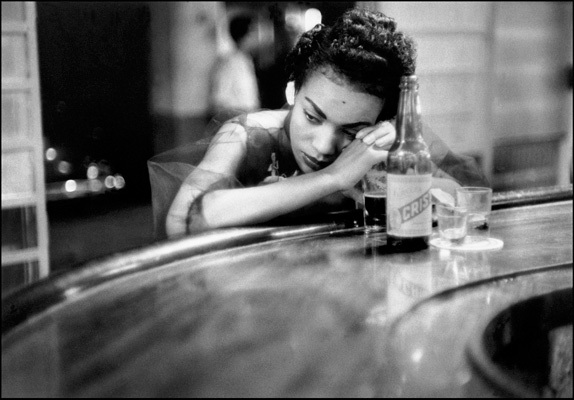 Bar Girl taken in 1954 in the red light district of Havana Cuba. For me the strength of this image is in the downcast eyes of the girl and her body posture capturing a moment of quiet reflection. The way she is positioned at the bar, drink in front of her, no-one around her creates a sense of sadness, a perception of loneliness, yet at the same time great beauty. 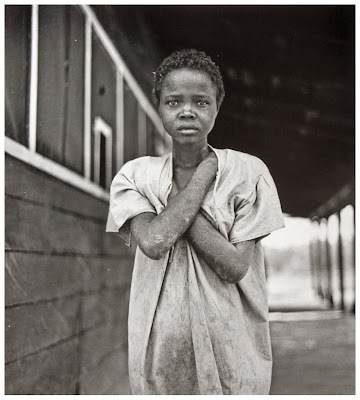 The Milltown girl taken in 1954 at an asylum in Haiti where American drug companies were testing a tranquilliser drug. I feel drawn into the picture not only by her eyes but her whole body language. She feels like a prisoner trapped in her own body. I had that feeling even before reading about the drug trials. These moments aren't always apparent at first glance, they are shared with the photographer. The way her arms are crossed over her body, the lines of the corridor on the right hand side and the plain windows on the right all seem to emphasis the sense of entrapment. The sameness of her life. Eve Arnold had a special talent in getting people to share these moments with her. She calls it her natural curiosity. The relationship between subject and photographer is what is what I try and achieve in my work. An example of where I feel I have come close to this is in this picture below of Kelly. a young homeless woman who had just arrived in London. I feel I have successfully captured the despair in her face. It was dark and I only had my camera, no flash, so I used street lights to enable me to take the shot. I have concentrated on her face and expression. After looking at Eve Arnold's Harlem photos I can see the importance of drawing back a little to incorporate more body language. To add a sense of place.